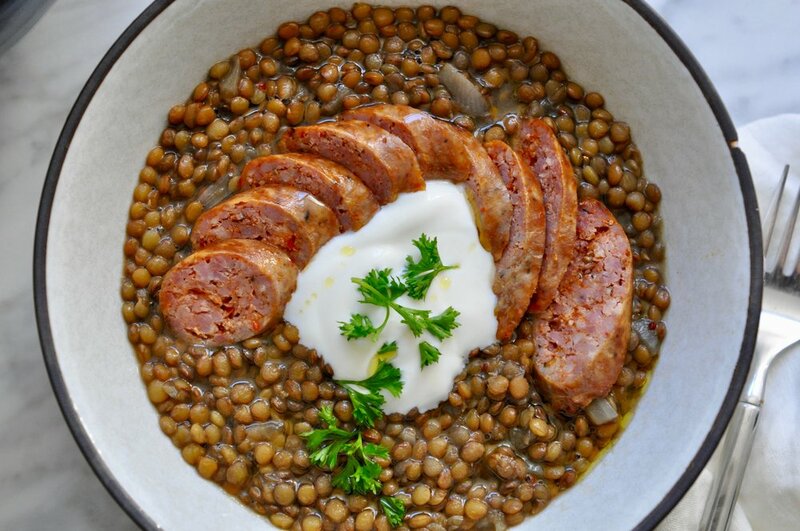 Lentils are one of the luckiest foods you can eat on New Year's eve (according to my Italian stepdad, that is). Symbolic of coins, the mo' you eat, the mo' cash money you can expect to make in the coming year. This simple recipe is best (and most legit) when made with Umbrian lentils, good quality stock and your fanciest olive oil. Buon appetito! In a mortar and pestle or spice grinder, crush the coriander and cumin seeds. In a large sauce pot over medium heat, warm 1 tablespoon olive oil. Add the sausage and cook until browned on all sides and cooked through (it's okay if it's still slightly pink in the middle). Remove the sausage from the pot and set aside. Add the onion to the pot with a pinch of salt and let it cook in the sausage fat and oil until translucent. Then add the crushed coriander and cumin. Stir in the cayenne or crushed red pepper and let cook 1 minute. Add the lentils and stock (the lentils should be submerged in liquid by about an inch). Turn the heat to low and add the garlic cloves. Let the lentils come to a very slight simmer, then cover the pot with a lid and cook until all the water has absorbed and the lentils are tender. It should take about 30 to 45 minutes. Once cooked, remove the pan from the heat and season with salt and pepper, to taste. Drizzle in the remaining olive oil. Roughly chop the parsley. Slice the sausage into coins. Spoon into individual dishes, top with the parsley and a dollop of yogurt, if using.